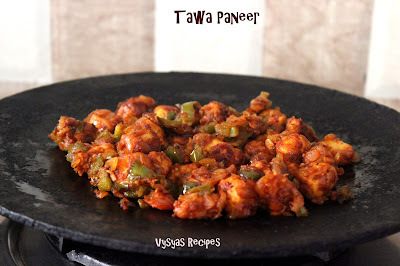 Tawa Paneer Masala is an Easy & Quick Paneer Side dish Recipe, made with Onion,tomato,Capsicum,Paneer & some Spice Powders.The Entire Gravy is made using Tawa. 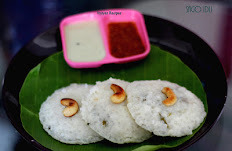 It accompanies Chapathi,Roti,Naan,Rice,Phulka,Jeera Rice & Poori. It is an Semi Dry Gravy. When the gravy cooked on tawa, it gets it unique taste & flavour.My Husband became the fan of this Gravy. Chop the Paneer into 1/2 inch cubes. Grind the tomatoes in a blender or Mixie into a fine Puree. Heat the tawa, then melt the butter. Add Cumin seeds & Ajwain seeds. Saute till you get nice aroma from it. Add Ginger Garlic Paste & Green Chillies. Saute till Raw smell in Ginger Garlic Goes off. Add Onions,Saute till it turns Pink. Add Capsicum Saute for 3 minutes. Then add all spice Powders such as Coriander Powder,Turmeric Powder,Chilli Powder.Mix well, such that masala Powders blends well with Onions & Capsicum. Add Tomato Puree & 1/2 cup of water. Add Garam Masala. 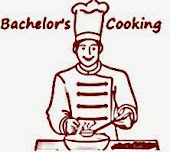 Saute till raw smell of Pureed tomatoes Goes off & Masala thickens slightly & also you get nice smell from Gravy. 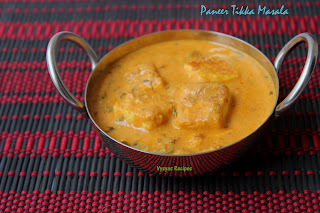 Now add Paneer cubes Mix well, such that masala gets coated evenly on Paneer. Garnish with crushed Kasthoori Methi. 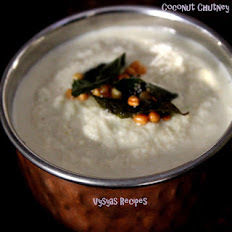 Serve hot with Chapathi,Roti,Phulka,Kulcha,Naan,Rice or Jeera Rice. Instead of using Ginger Garlic Paste, you can crush fresh Ginger & Garlic in Mortar & Pestle for Nice flavour. Instead of Pureed Tomatoes, you can use finely Chopped tomatoes. if you don't have tawa, you can use frying Pan. 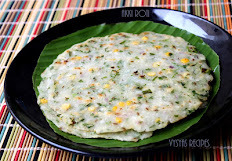 if using tawa use Medium or large size tawa for Easy Cooking. wow!! love paneer in any form!! this is such a lip-smacking curry!! superb! !